NXT may have been heading out of Takeover: Brooklyn II, but the show was back at the Barclay's Center this week for a compact edition of the show. With just two matches would NXT still keep the quality action coming? In the other match on the show, The Authors of Pain (Sunny Dhisa renamed Akam and Gzim Selmani renamed Rezar) remained undefeated after a victory over TM61 (Nick Miller & Shane Thorne). I've been impressed with Akam & Rezar in their previous appearances and they continued to impress here, in what was a match that was booked to get the most out of every body involved. Both teams came out of this one looking better than they did coming in, with The AOP looking like dominant bad asses with some different moves, whilst TM61 showcased their pace and fighting spirit. Miller's comeback on Rezar featured a number of strong-style strikes, which built nicely to Rezar getting knocked off his feet, whilst The AOP cleaning house towards the finish made the pair look great with their stereo running powerbombs and the Russian leg sweep and lariat combination getting them the win on Miller. After victories over American Alpha and TM61, it looks like The AOP are being positioned for a future Tag Team Championship match. 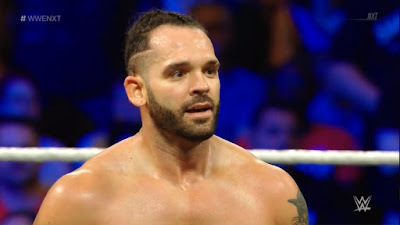 Whilst the two matches on the show were both good, apart from a couple of post-match interviews from Takeover: Brooklyn II, the rest of the show was either highlight packages from the supercard, ads for the WWE Network or Corey Graves and Tom Phillips putting over the strength of that show. Overall, there was more recycled content then there was fresh content here, meaning that the brand didn't really more forward and coming out of a hot show that's a frustrating experience. With the show airing on the WWE Network there isn't much need to add in the highlight packages as that show is already available. Previous post takeover shows have featured an extra match and this would have at least filled up a little more time. It's not like their was a lack of talent either with no matches across the Brooklyn tapings from Hideo Itami, Oney Lorgan, Rich Swann, Peyton Royce, Nicola Glencross, Steve Cutler, Alexander Wolfe, Hugo Knox, Liv Morgan, Patrick Clark, Aaliyah, Buddy Murphy, Angelo Dawkins, Mandy Rose, Tino Sabbateli, Riddick Moss...I think I've made my point. One more match.